The Maelstrom by Henry H. Neff. Book 4 of the Tapestry Series. 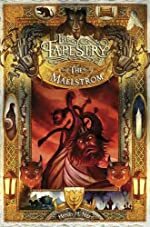 Review: The Tapestry: The Maelstrom is written by Henry H Neff and is the fourth book in the Tapestry series. The main character in the story is Max Mcdaniels, a few other characters include David Menlo, Mina, and a Smee named toby. Also some minor characters include Ms. Richter the director of Rowan where the book takes place, Ms. Boon a teacher at Rowan, and Elias Bram the Archmage.The Tapestry: The Maelstrom takes place at Rowan an academy for wizards and a refuge. Rowan is on the brink of war with the demon Prusias and has demanded that Rowan give into his demands and ultimately the end of Rowan. But the people at Rowan will fight until their death. However, the rumor is that Prusias has devised a secret weapon that is sure to secure his victory. So Rowan must rely on Max Mcdaniels and David Menlo to protect Rowan. Just to start off, this book is AMAZING. It has fast-paced action, likeable and realistic characters, and not to forget amazing battles. About the characters, they have realistic responses to what is happening around them. Also the plot is really well thought out and detailed, there isn't a single sentence without detail. The Tapestry: The Maelstrom in my opinion is generally for kids in middle school through high school. But all in all this is a phenomenal story that I just couldn't put down. Review written by Mark (6th grade student). We would like to thank Random House for providing a copy of The Maelstrom for this review. Have you read The Maelstrom? How would you rate it? Hi, I have just started the last book of the series, The Red Winter, but realised I have forgotten what happened at the end of The Maelstrom as I had read it a while ago!! Can you please tell me what happened in the final chapter? Thanks in advance!